Green Apatite is a variety of Apatite that can be found in chunk and crystallized form. It’s been known to grow off of other crystal masses such as Orange Calcite, pictured below. 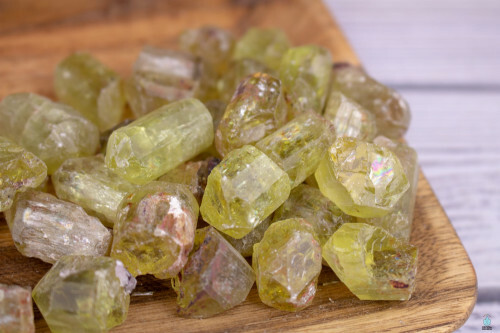 The finest Green Apatite specimens have come from Russia and Madagascar, but newly discovered pockets of this beautiful gem have been popping up throughout Canada. Green Apatite is a very calming and soothing stone. Our heart, throat, and third eye chakras become activated and aligned when working with this stone. When these chakras are activated together, one will notice how clearer their communicative skills are. 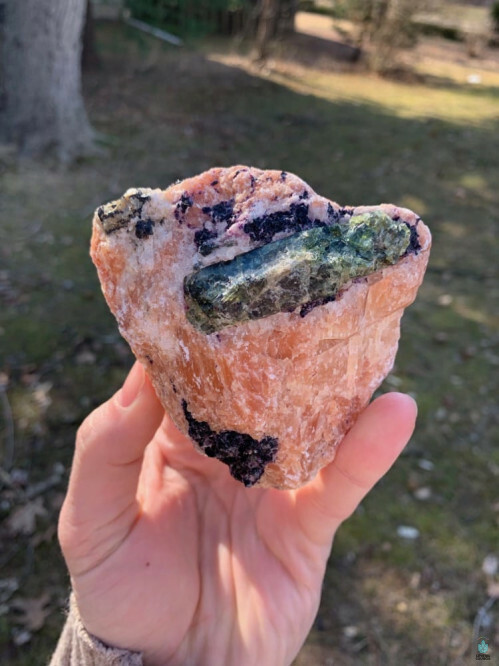 You’ll soon realize that the more you work with this stone, the more it pushes you to speak from the wisdom of the mind, with love radiating from your heart. This stone works with your emotions and strengthens them so that they may not overwhelm you during difficult times and conversations. We recommend carrying or wearing this stone when involving yourself in uncomfortable situations, or vocalizing sensitive material and information you hold very close to you. If you are someone who regularly goes to therapy or are about to start and are riddled with anxiety, bring Green Apatite with you. This stone will help you choose the right words to say, while also not letting emotions get the best of you. It really keeps your mind and heart from overwhelming you, while pushing you to speak freely about difficult subjects. Green Apatite has a deep rooted connection with nature and Mother Earth. This stone has been known to help assist in communication with faeries and animal spirits. It’s a perfect stone for outdoor meditation, especially on a beautiful spring or summer day. This stone activates and imbues the user with Earthly Healing energy that we can then channel and use to help other beings. When mediating with Mother Earth and channeling her energies, we recommend using Green Tourmaline in conjunction with Green Apatite. Both these green stones will enhance and expedite the healing energies our beautiful planet offers, while also pushing us to unlock our heart to its fullest potential and capacity. Carrying or wearing both these stones together will force a wide open heart that’s capable of absorbing endless amounts of positive energy, we can then channel to others around us.